Sir Thomas Lawrence (13 April 1769 - 7 January 1830) was an English portrait painter and President of the Royal Academy from 1820-1830. 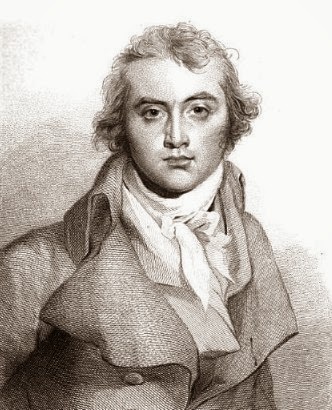 Thomas Lawrence was born in Bristol on 13 April 1769, the youngest surviving child of Thomas and Lucy Lawrence. In 1773, the family moved to Devizes where his father was landlord of the Black Bear, a busy coaching inn. Lawrence was both good looking and talented. By the age of ten, he was producing pencil portraits of visitors to the inn and entertaining guests by beautifully reciting verse, especially Milton and Shakespeare. 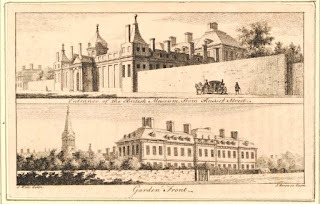 He sketched Lord and Lady Kenyon who stayed at the inn in 1779(1). 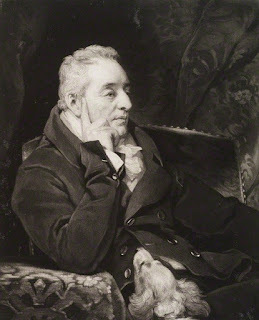 The actor David Garrick was a frequent visitor and could not decide whether the boy’s future lay in acting or drawing. 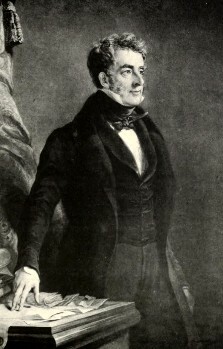 Lawrence visited both Weymouth and Oxford, where “he took the likenesses of the most eminent persons then at Oxford”(3), before moving to Bath where he became the chief earner in the family, his father having been declared bankrupt. He received encouragement from William Hoare, a fashionable portrait painter, and sold small pastel portraits, usually displaying a half-length, for three guineas a time. Lawrence also fell in love with the theatre at Bath, where he first saw Mrs Siddons. In 1784, Lawrence was awarded the silver palette and five guineas by the Royal Society of Arts in London for his copy of Raphael’s Transfiguration. 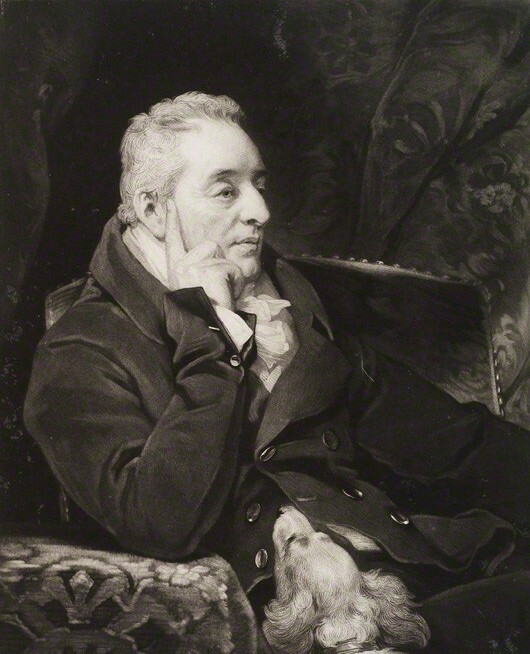 In 1787, Lawrence moved to London and was admitted as a student to the Royal Academy. He started exhibiting at the Academy exhibition at Somerset House the same year. 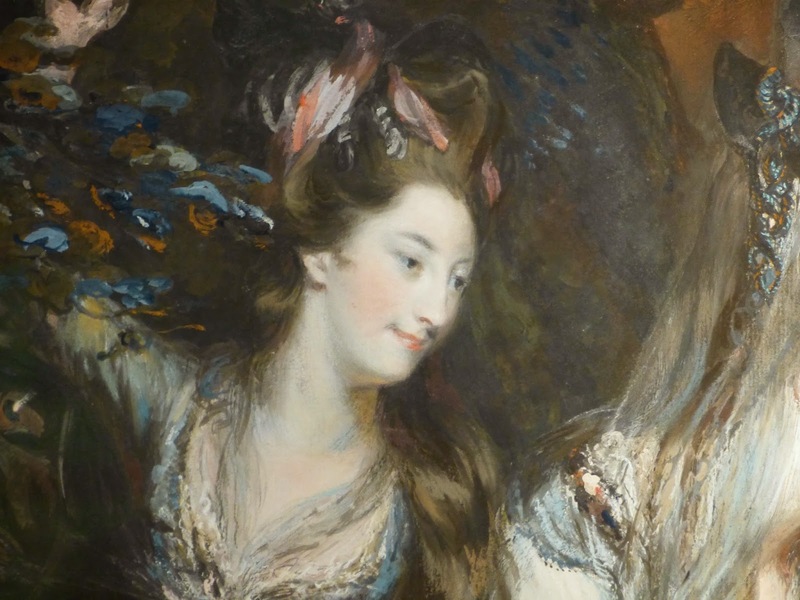 In 1789, Lawrence was summoned to Windsor to paint Princess Amelia and Queen Charlotte, and on the death of Sir Joshua Reynolds in 1792, he was appointed painter-in-ordinary to George III and exhibited a picture of the King. He became a full member of the Royal Academy in 1794, at the earliest possible age of 25. Lawrence supported the acquisition of the Elgin Marbles by the British Museum in 1816 and was appointed President of the Royal Academy in 1820 on the death of Benjamin West. He was elected a member of the Dilettanti Society in 1792 and succeeded Sir Joshua Reynolds as their appointed painter. In 1802, Lawrence exhibited a full length picture of Caroline, Princess of Wales, and her daughter, Charlotte. During the course of the sittings at Montague House, Blackheath, he had necessarily become “very intimate” with the Princess of Wales and her daughter and “fame was busy in attributing his visits to improper motives”(4). His relationship with the Princess of Wales was questioned during the Delicate Investigation of 1806 but he was cleared of any impropriety. 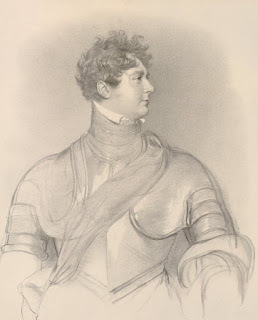 In about 1810, Major General Charles Stewart had his portrait painted by Lawrence and the two men became friends. In 1814, Stewart encouraged the Prince Regent to have his portrait painted by Lawrence in field marshal’s uniform. The Regent was delighted with the result and proceeded to commission portraits of the allied sovereigns and their generals. 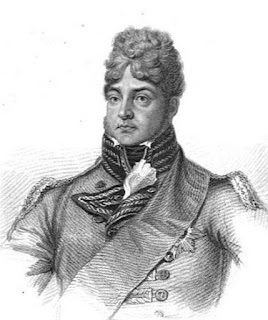 Lawrence was knighted in April 1815 and in his travels over the subsequent years, he visited Paris, Vienna and Rome in fulfilment of his commission. The completed portraits now hang in the Waterloo Chamber at Windsor Castle. As a young man, Lawrence was handsome and lively, as well as accomplished, despite his lack of formal education. He had polished manners and was an elegant dancer, fencer and billiard player as well as an excellent violinist and singer. Although noted for his kindness to his servants, some of his contemporaries found him rather too reserved. Although very hard-working, Lawrence was notorious for the speed with which he fulfilled his commissions. On his death, over a hundred unfinished paintings were found in his studio. Throughout his lifetime, Lawrence struggled with his finances. It seems to have been a result of carelessness and overspending rather than profligacy. He was generous to both his family and other artists and spent large sums of money adding pictures to his collection. By 1807, he was more than £20,000 in debt and he died insolvent. 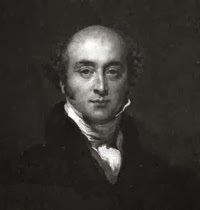 In the 1790s, Lawrence was romantically involved with both Maria and Sally Siddons, Mrs Siddons’ two eldest daughters. He first fell in love with Sally and then Maria, only to break with Maria and return to Sally. Lawrence was forbidden to communicate any further with them and both sisters died young - Maria in 1798 and Sally in 1803. Lawrence never married. According to Williams’ Life, Lawrence cherished an unrequited love for a Miss Upton, sister of Lord Templetown, for two years(7). Lawrence was very much attached to Mrs Isabella Wolff, the wife of a Danish consul, who separated from her husband in 1810, but Williams’ life describes this as a “more intellectual attachment”(8). He began a portrait of Mrs Wolff as early as 1803, but only finished it in time for the Academy exhibition of 1815. Another close friend, Miss Elizabeth Croft, wrote a detailed journal of the last week before Lawrence died. Lawrence died suddenly on 7 January 1830. He was given a public funeral on 21 January, with Sir Robert Peel and Lord Aberdeen among the pall bearers, and was buried in St Paul’s Cathedral. Read about other Regency era painters - John Constable and Sir Joshua Reynolds. Read about the Royal Society of Arts. (1) Michael Levy notes the date of the Kenyons’ visit as 1779 rather than 1775 as stated in Williams’ Life Vol I p40. This suggests that the portraits were done when Lawrence was aged about 10 and not 6. (2) From the Diaries of Madame d’Arblay, April 1780. Charles Townley is in the chair to the right. 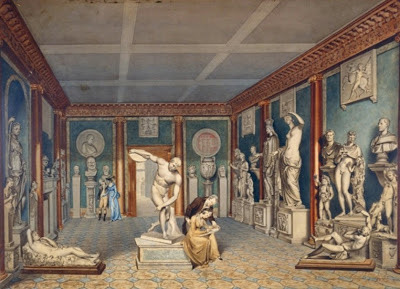 Charles Townley (1 October 1737 - 3 January 1805) was an antiquarian and collector and a trustee of the British Museum. Charles Townley was born on 1 October 1737 at Towneley Hall near Burnley in Lancashire, the eldest child of William and Cecilia Towneley (1). Because the family was Catholic, there were limited educational opportunities available for Townley in England, and so, in 1747, he and his brother Ralph were sent to be taught at the English College at Douai in northern France. In 1753, Townley moved to Paris where he was tutored by the Reverend John Turberville Needham before being introduced into Paris society by his father’s uncle, the Chevalier John Towneley. In 1758, Townley came of age and took control of the lands that he had inherited from his father back in 1742. He was a good landlord, improving his estates, and enjoying the life of a country gentleman. He was also involved in the construction of the Leeds-Liverpool canal. In 1767, Townley embarked upon the Grand Tour, visiting Naples, Paestum and Rome. Whilst in Rome, he began to collect antiquities, particularly marbles. 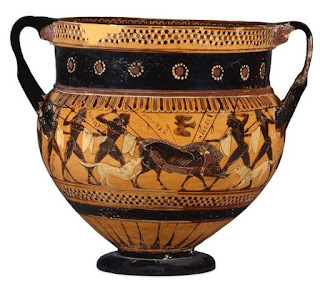 Initially he made some bad purchases, but he learnt through his experience and became a more discerning collector, rejecting items which had been incorrectly restored. He used Roman dealers such as Piranesi and the English dealer, Thomas Jenkins, for his purchases, which included Astragalizontes - two boys quarrelling over a game of knucklebones – which he bought from Jenkins for £400. In 1771, Townley visited Italy again – Rome, Naples and further afield into southern Italy and Sicily. 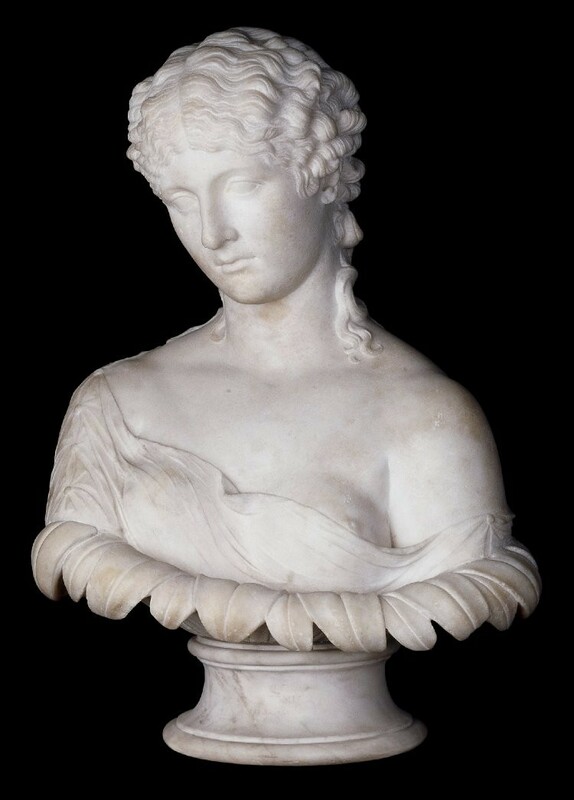 Amongst the additions made to his collections on this visit was a marble bust thought to be of the nymph Clytie as well as a number of sculptures that he acquired through dealers such as Jenkins and Thomas Byres and also the painter and dealer, Gavin Hamilton. After returning to London, Townley continued to build his collections through Jenkins and Hamilton, especially with sculptures from Hamilton’s excavations. 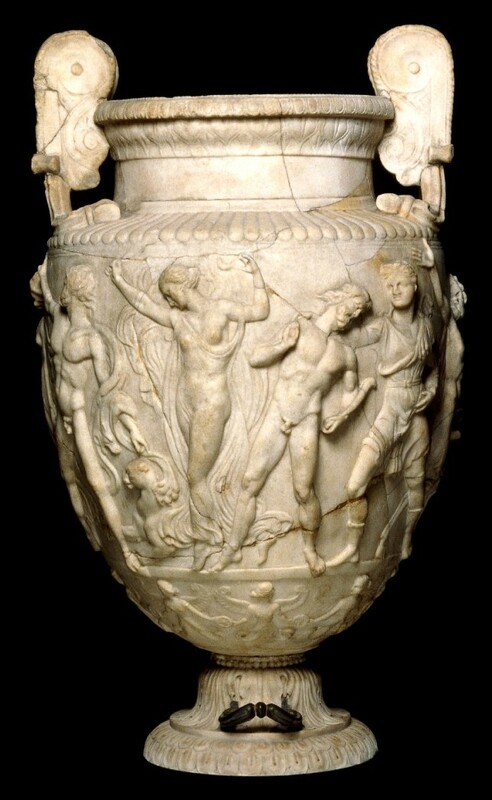 These included the marble Townley vase and the Townley Venus, which was controversially exported in two parts by Hamilton in order to avoid papal enquiry. Townley spent another three months in Italy in 1777, mostly in Rome, buying from Hamilton, Jenkins and local dealers as before. 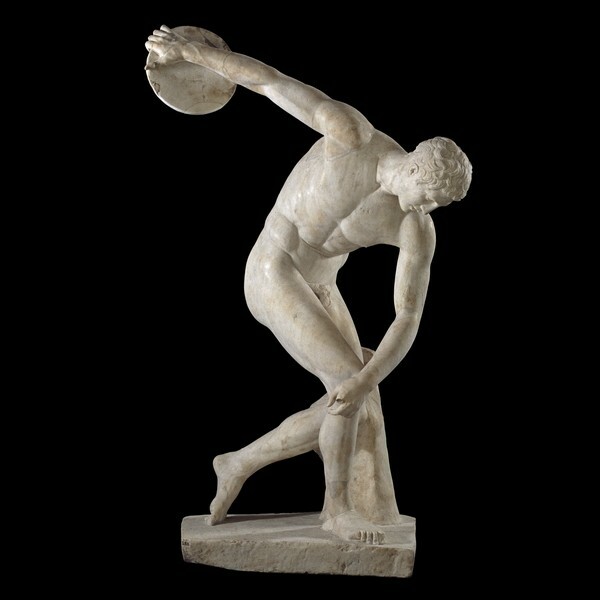 After his return to London, Jenkins continued to send him antiquities, including a Roman marble copy of the bronze discus-thrower, Discobolus. 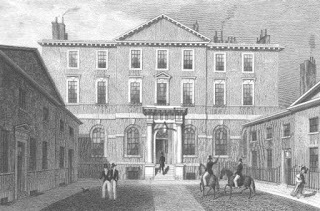 Townley moved into 7 Park Street (2), a house that had been specially designed for him by Samuel Wyatt to display his collections, in 1778. Townley’s collection of marbles could rival any other in England and soon became a London visitor attraction. 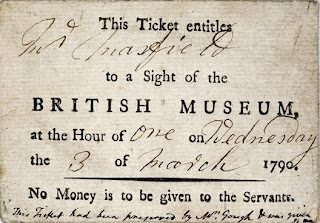 Townley welcomed visitors, either showing them round himself or, from about 1786, providing them with a catalogue of his collections. In 1783, Johan Zoffany painted Townley in his Park Street library amongst an imaginary arrangement of some of his sculptures, together with three colleagues: Charles Greville, Thomas Astle and Pierre François Hugues, known as Baron d’Hancarville, who spent years sponging off Townley whilst he catalogued his marbles. A print of this painting appears at the top of this article. The 1780 Gordon Riots caused great panic amongst the Catholics in London. Fearing an attack on his house, Townley fled from Park Street. Some sources say that he took the Bust of Clytie to his carriage with him (3); others doubt whether this was physically possible for him to have done single-handedly. Townley was elected a fellow of the Society of Antiquaries and a member of the Society of Dilettanti in 1786 and a fellow of the Royal Society in 1791. 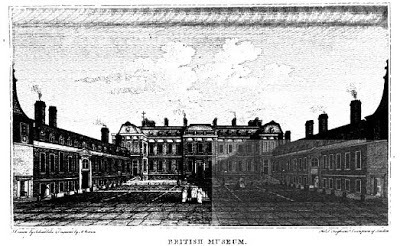 He was elected a trustee of the British Museum in 1791 and was able to influence the design for the planned extension to the museum. Despite the time that Townley devoted to study and his expertise in antiquities, his only printed work was a dissertation on a Roman helmet. Townley never married. Perhaps he was married to his collections. He was certainly a compulsive collector. 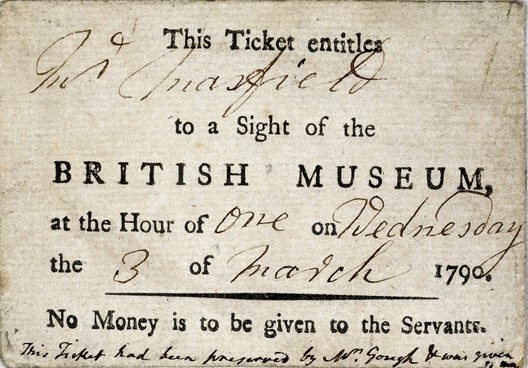 According to a financial statement from 1779, he had spent about £11,600 on antiquities. 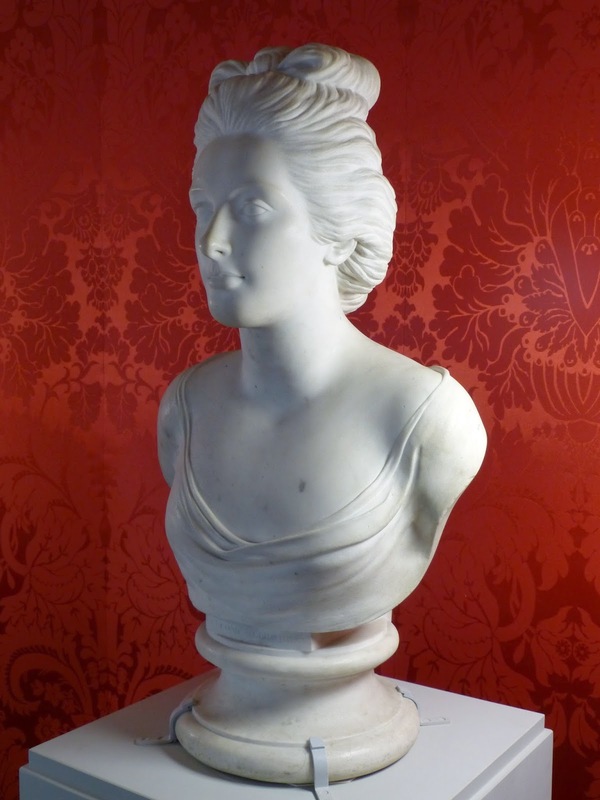 The bust of Clytie was his favourite marble and Sir Henry Ellis recorded that “he used jocosely to call it his wife” (3). When at his house in Park Street, he lived simply with few servants and no carriage; all available space was given over to housing his collections. But he was not parsimonious; he gave excellent Sunday dinners to his friends. He was also a talented artist and some of his sculptures are now known only from the drawings he made of them. Most of these drawings are now owned by the British Museum. Townley died on 3 January 1805 at his house in Park Street in London and was buried in the family vault in St Peter’s Church, Burnley, on 17 January. He left his marbles in trust for his heir, providing that they build a gallery to display them, or otherwise, to the British Museum. In the end, all the marbles, with some terracottas and bronzes, were sold to the British Museum for £20,000. 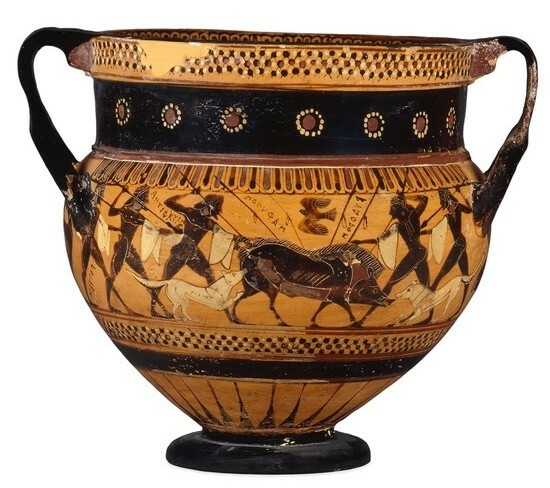 This became the core of the Graeco-Roman collection at the British Museum. (1) Although the family name was generally spelt Towneley, Charles Townley signed himself Townley, dropping the extra “e”. (2) This house is now 14 Queen Anne’s Gate. If you are looking for a conventional biography of Jane Austen with a chronological record of her life, then this book is probably not for you. The Real Jane Austen takes a different approach to looking at the life of one of my favourite authors. Byrne presents Jane’s story thematically, basing the chapters on visual stimuli - objects owned by Jane herself and others that represent key aspects of her life. She examines each theme in relation to Jane’s own experiences, and those of her extended family and friends, and shows how these things influenced her writings – her juvenilia and unfinished works as well as the six published novels that we know and love. 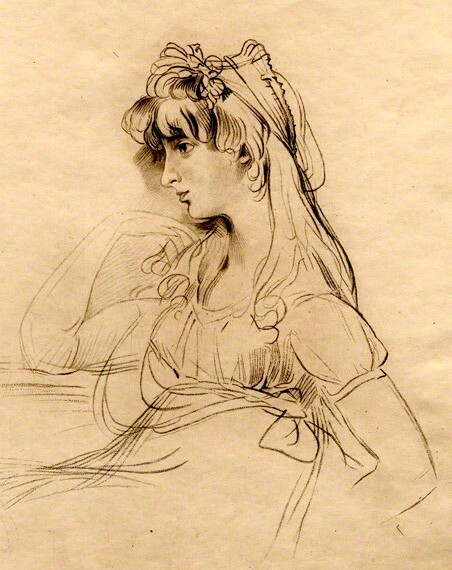 Jane is shown to be a woman who loved her work and revelled in her success; who was terrified of childbirth and content to remain single with the companionship of her beloved sister Cassandra; who loved the theatre and the seaside and delighted in family jokes; who was a devout Christian, but by no means so strait-laced as we often imagine. The book seeks to dispel one of the myths that have grown up around Jane: that she existed in a closed world as a spinster in the country, unaffected by the world events that raged around her. 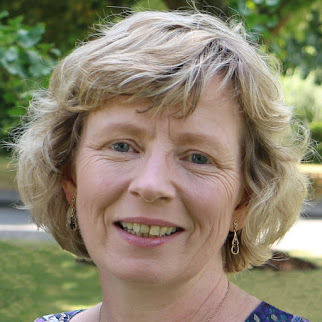 Byrne describes how Jane was a frequent traveller and had family connections with the West Indies and was closely linked to the French Revolution which left one of her relatives a widow. Although this book is not meant to be a chronological record of Jane’s life, I would have found an appendix with key dates helpful for reference purposes and perhaps a family tree or two to explain visually some of the more convoluted relationships within the extended family, whose stories add so much colour to this biography. One of the gems with which this book is littered concerns Mrs Norris of Mansfield Park. Byrne makes the connection between the name of Jane’s most unpleasant character and that of a notorious slave trader mentioned in Clarkson’s History of the Abolition with which Jane was familiar. It is in these small things that we grasp a little more of what the real Jane was like. I would recommend this book to any fan of Jane Austen who is interested in knowing more about her as a person and the things that influenced her work. Lady Melbourne (baptised 15 October 1751 - 6 April 1818) was a leading Whig hostess, the intimate friend of Georgiana, Duchess of Devonshire and Lord Byron, a mistress of George IV and the mother of the Prime Minister, William Lamb, Viscount Melbourne, and his sister Emily, Lady Cowper, one of the patronesses of Almack's Assembly Rooms. Elizabeth Milbanke was baptised on 15 October 1751, the only daughter of Sir Ralph Milbanke, a Yorkshire landowner and politician, and his wife, Elizabeth Hedworth. She married Sir Peniston Lamb, 2nd Baronet, a wealthy Whig politician, on 13 April 1769, at the age of seventeen. Sir Peniston was made an Irish peer, Lord Melbourne, Baron of Kilmore, on 8 June 1770, and then Viscount Melbourne on 11 January 1781. Later, in 1815, he was made a peer of the United Kingdom, Baron Melbourne of Melbourne. Elizabeth was beautiful and vibrant and ambitious for the advancement of her family. 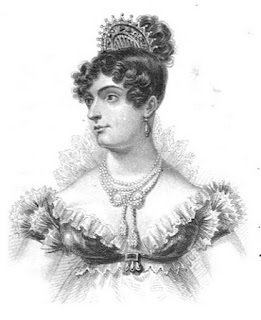 She helped increase her husband’s political visibility, becoming the leading Whig hostess of the time. From 1770, she entertained in the white and gold magnificence of Melbourne House in Piccadilly, designed by William Chambers. 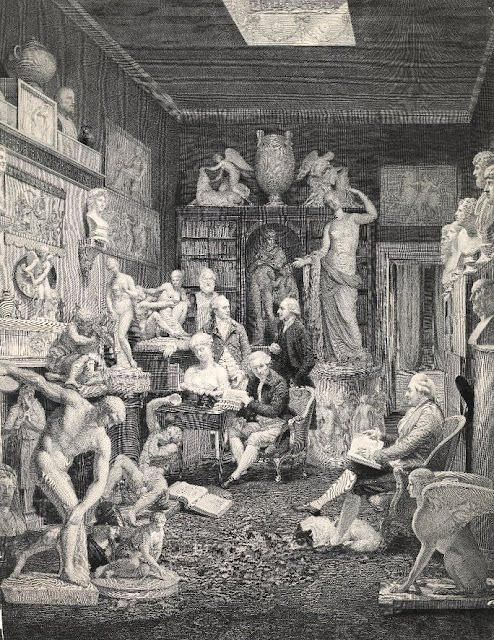 Her regular visitors included some of the keenest minds of the day: Charles James Fox; Richard Brinsley Sheridan; Granville Leveson-Gower, 1st Earl Granville; Georgiana Cavendish, Duchess of Devonshire; Harriet Ponsonby, Countess of Bessborough; and the sculptor, Anne Seymour Damer. In 1774, the Duke of Devonshire married Georgiana Spencer and Lady Melbourne saw at once that she was in danger of losing her place as leading Whig hostess. But rather than compete with the Duchess, Lady Melbourne chose to embrace her potential rival and became her indispensable friend. They were opposites in character and temperament, but Lady Melbourne’s disposition made her the ideal confidante for the troubled Duchess. Lady Melbourne was a brilliant conversationalist who was a master of the art of being a delightful companion to gentlemen. She was easy going and good humoured, a willing confidante and advisor who rarely talked about herself. Melbourne House was a comfortable place for gentlemen to go, where they could speak freely without fear of shocking their hostess. Ambition was paramount and she was always prepared to make sacrifices to achieve it. When Frederick, Duke of York expressed a fancy for her Piccadilly home, she agreed to part-exchange it for his home in Whitehall(2). Lady Melbourne had six children: Peniston (1770), William (1779), Frederick (1782), George (1784), Emily (1787) and Harriet (1789), who did not survive childhood. Of these, only Peniston was definitely Lord Melbourne’s child; William was almost certainly Lord Egremont’s and George, the son of the Prince of Wales. She was devoted to all her children who spent most of their time at the family’s country home in Hertfordshire, Brocket Hall. Here they rode and played together and took part in theatricals as well as learning. 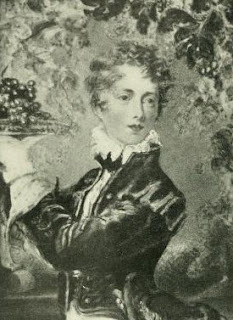 When the boys went to Eton, she often visited them, encouraging the development of their tastes and characters. Within a year of their marriage, Elizabeth’s husband began an affair with the actress Sophia Baddeley. Elizabeth appeared to be unbothered. She did not expect men to be monogamous, though she strongly believed in family responsibility. Having produced an heir, she had her own romantic liaisons, though she made sure she never put her husband in an awkward position. Lady Melbourne’s name was linked variously with Lord Coleraine3; Francis Russell, 5th Duke of Bedford; George, Prince of Wales, the future George IV; and George Wyndham, 3rd Earl of Egremont. From 1779, Lady Melbourne’s most favoured intimate friend and advisor was George Wyndham, 3rd Earl of Egremont. It was the most serious and long-lasting of her attachments, though not monogamous on either side; Egremont kept a number of mistresses and their children at Petworth House. Egremont was almost certainly William’s father and possibly Frederick and Emily’s as well. 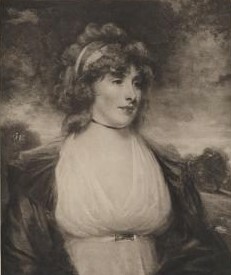 Lady Melbourne learned much from Egremont who was an agriculturalist and canal enthusiast. 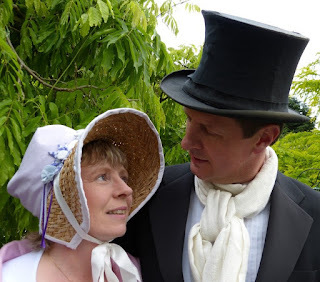 She encouraged her husband to invest in the Cromford Canal and introduced agricultural innovations in Hertfordshire. Lady Melbourne’s friendship with the Prince of Wales began in 1782 and their names were linked together until around 1786. He is generally believed to be the father of her fourth son, George, and stood as his godfather. Through her relationship with the Prince, Lady Melbourne secured the position of Gentleman of the Bedchamber for her husband in 1783. Lady Melbourne soon realised that William’s abilities were superior to those of his siblings and he became the focus for all her ambitions. After the death of her eldest son, Peniston, in 1805, William embarked on a career in politics. He also married Lady Bessborough’s daughter, Lady Caroline Ponsonby. Lady Melbourne was not keen on the match or the influence that Caro and her mother had on William. 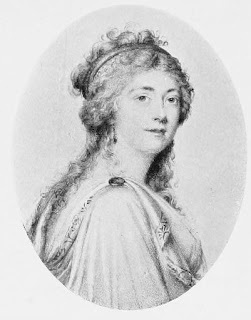 On her side, Lady Bessborough disliked Lady Melbourne and referred to her as “The Thorn”. It was with some frustration that Lady Melbourne saw William failing to reach the heights which she sought for him. He was hedonistic and lazy, loyal to people rather than policies, and did not advance as she had hoped, and his deteriorating relationship with Caroline was not helping. 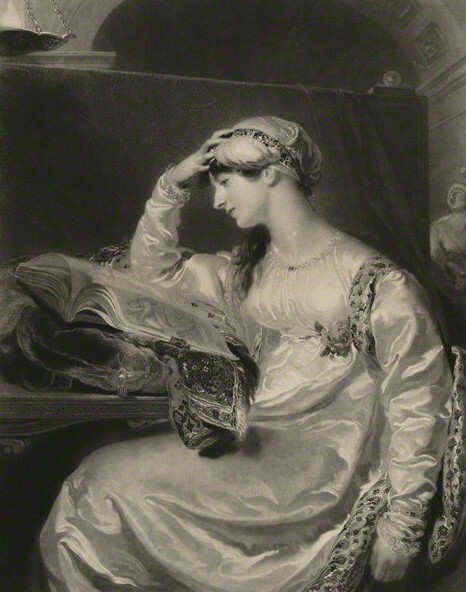 Lady Melbourne had no sympathy with Lady Caroline’s highly strung nature and was disgusted when, in 1812, she had a very public affair with Lord Byron. 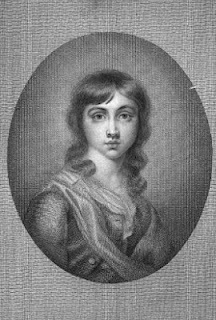 Lady Melbourne was keen to bring it to a close and became Lord Byron’s confidante, suggesting her own niece, Annabella Milbanke, as a wife for him. Lady Melbourne became ill with rheumatism and died at Melbourne House, Whitehall, on 6 April 1818, after a painful illness of four months. She was buried on 14 April in Hatfield, Hertfordshire. Even on her death bed, she encouraged her children’s ambitions, telling Emily to be faithful, not to her husband, Lord Cowper, but to her lover, Lord Palmerston. Lady Melbourne did not live to see that her ambitions for her children were indeed fulfilled: William became Prime Minister to William IV and then Queen Victoria, and Emily married Lord Palmerston, who later became another of Queen Victoria’s Prime Ministers. (1) From a letter to Lady Caroline Lamb 13 April 1810. (2) The agreement to the exchange was concluded on 25 December 1791 although the comment made by the Duke of York to which Lady Melbourne assented may have been made some time before. The Duke took residence of Melbourne House the following year, renaming it Albany House. (3) The relationship with Lord Coleraine is referred to in Cecil's book Melbourne. Based on the dates quoted, I am assuming that it is John Hanger, 2nd Baron Coleraine, with whom Lady Melbourne had an affair. 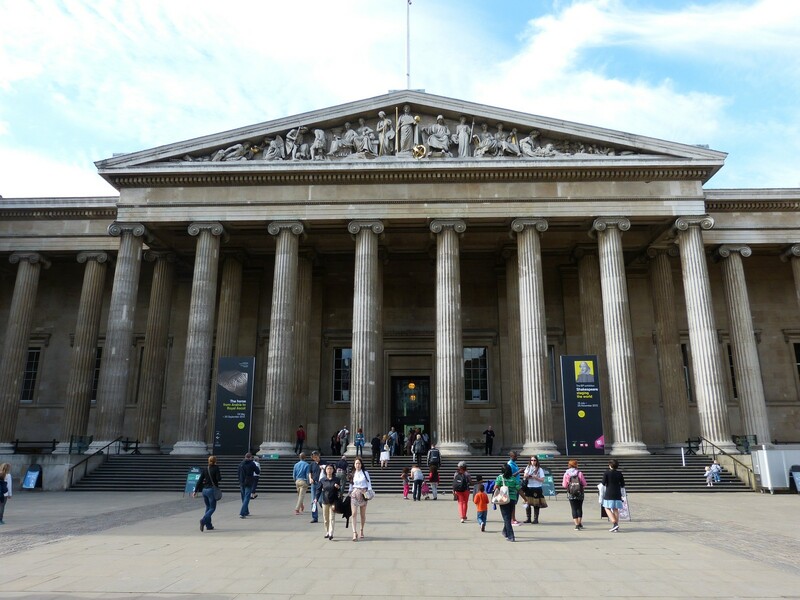 The British Museum was founded on 7 June 1753 by an Act of Parliament, becoming the first national public museum in the world. It was established as a result of accepting the bequest of the physician and naturalist, Sir Hans Sloane, who left the entire contents of his collection to George II in return for a payment of £20,000 to the beneficiaries of his will. 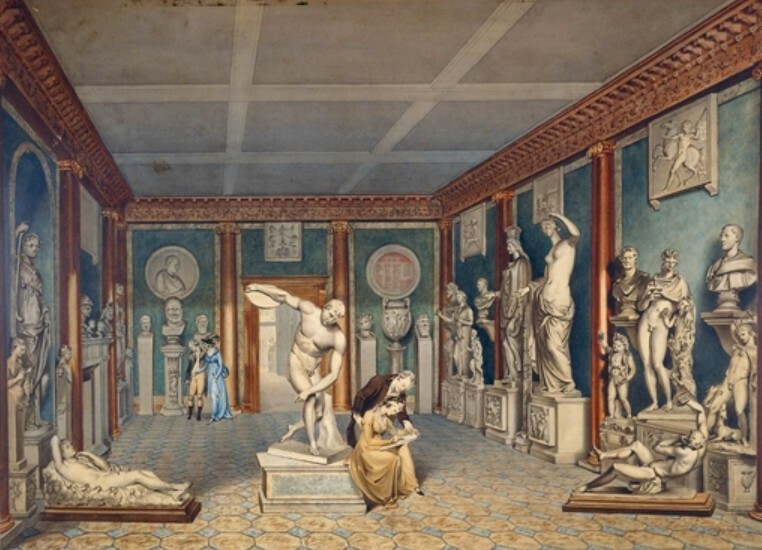 Sloane’s collection consisted of over 71,000 objects including books, manuscripts, natural specimens and antiquities such as coins, medals, prints and drawings. 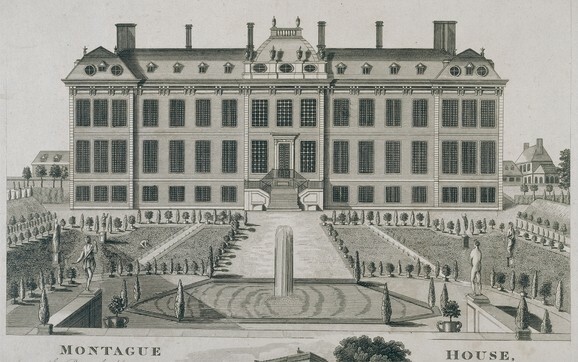 In 1755, the Trustees of the British Museum bought Montagu House in Bloomsbury to house the museum’s collections. The gardens were opened to the public from 11 March 1757 and the museum was opened to the public for the first time on 15 January 1759. In 1823, Sir Robert Smirke designed a new building to display the growing collections, consisting of a quadrangle with four wings and Greek style columns. The building was finished in 1852 and is still the centre of the museum complex today. Entry was free and granted to “all studious and curious Persons”(2). 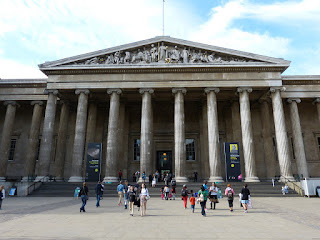 According to the British Museum’s website, visitors were taken round the exhibition by an under-librarian in groups of five, up the great staircase, through the upper rooms and down again to the ground floor. Various opening arrangements were adopted over the years, but by 1809, it seems that entry was no longer by ticket. The museum was open on Monday, Wednesday and Friday from 10am to 4pm and “all persons of decent appearance who apply between the hours of ten and two, are immediately admitted”(4). It was closed for Christmas, Easter and Whitsun weeks and during the months of August and September. People could stay until closing time if they wished, though children under ten were still excluded. According to Leigh's London guide, these arrangements were still in force in 1818. 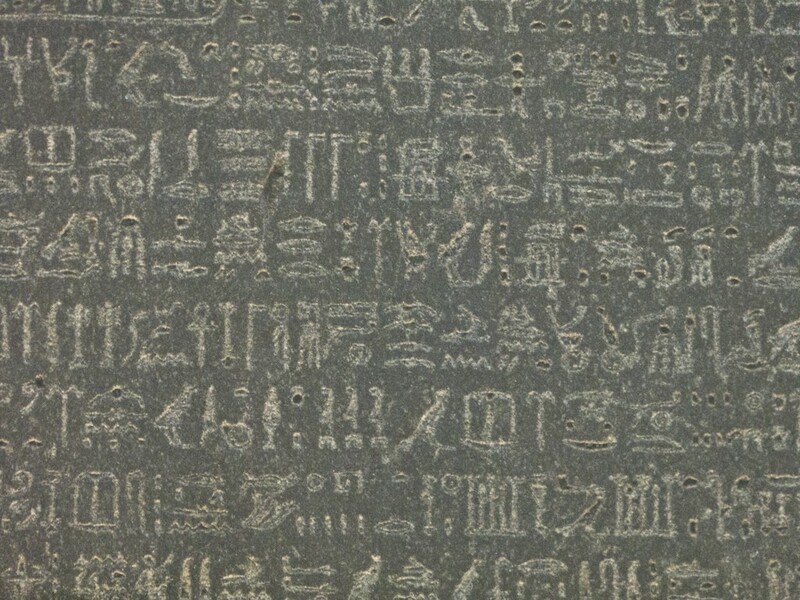 Initially the collections were split into three sections: printed books and prints; manuscripts including medals; and natural and artificial productions - basically, anything else. Upper floor: modern works of art; manuscripts; minerals; shells, fossils & herbals; insects, worms, corals & vegetables; birds & quadrupeds, stuffed; quadrupeds, snakes, lizards, and fishes, in spirits. 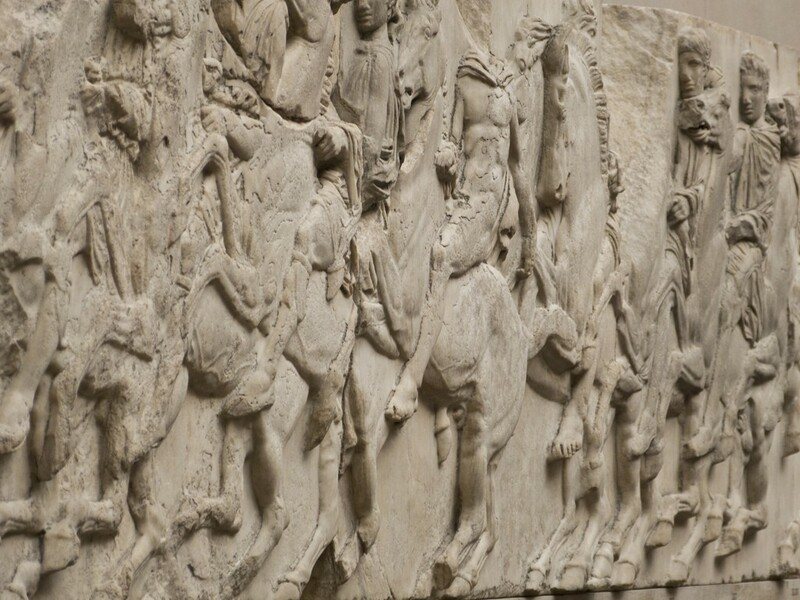 Gallery: terra cottas; Greek & Roman sculptures; Roman sepulchral antiquities; Egyptian antiquities; coins & medals; Sir William Hamilton’s collection; drawings & engravings. 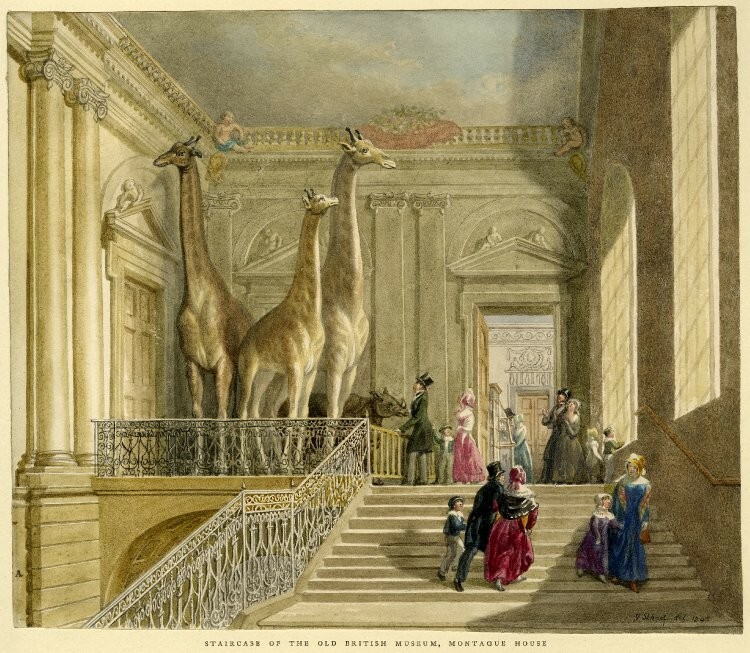 During the 1850s and beyond, the museum expanded its collections to include British and medieval antiquities, oriental art, prehistoric finds and archaeological material from Europe. 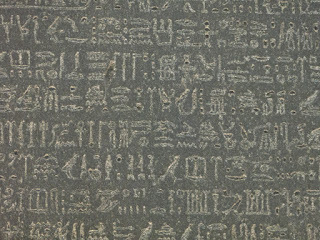 The museum was involved in excavation abroad – its Assyrian collections helped the understanding of an ancient Middle Eastern script called cuneiform and the Rosetta Stone unlocked the meaning of Egyptian hieroglyphic script. 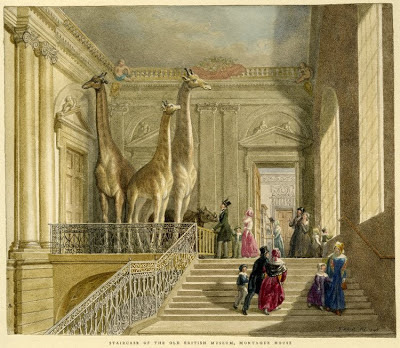 In the 1880s, the natural history collections were moved to a new building in South Kensington. This became the Natural History Museum. • George III’s library (1823) – donated by George IV; the quadrangular building was erected to house it.